Aurora came for a visit this weekend. She's 19 months old now and is starting to talk. She's good at repeating simple words like MaMa, baby, baba. She sings songs like row, row, row your boat. 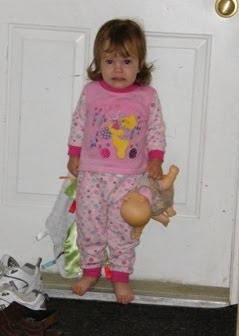 When she first got here, she wasn't so happy about her MaMa leaving and stood by the door with all her important things. The baby and her blankie. Poor thing. I felt bad that she wasn't excited to be here. But she soon came around when I showed her one of her favorite things to look at. My Jim Shore cat collection. Ohhhh, Kitty, she says. I don't let her touch them cause their tails might snap off so I bend each one over and she gives a kiss. Another high point of her visit is getting introduced to the Button Box. That was an after bath treat for her. 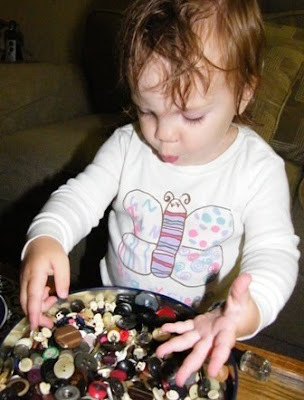 She loved loved loved playing with the buttons. I thought this would be a nice relaxing quiet time before bedtime. After a half an hour, she was still so excited, she was shaking. This button box has seen a lot of use over the past 10 years. I have bought many cute little buttons over the years to put as little treasures for the kids to find, but somehow, there is only one little cherry button and one little strawberry button left. Aurora didn't care, she loved swishing her hand around in the buttons. So, Grammie has a good excuse to buy more buttons at Fabricville. On our way back from the cottage the other day, we stopped at the little vegetable stand. I couldn't believe the produce and the beehive of activity out back. Workers were just getting off their shift. Tractors were bringing in pallets of tomatoes, corn, beans, cukes... everything. I really wish I had a garden. Anyway, I stood in front of the pickling cukes and had to think about the date. Oh man, it's the last week of August. 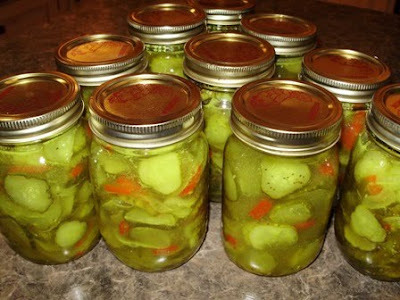 And I hadn't even thought about pickling. 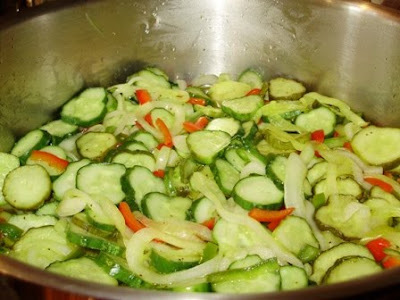 So I bought 2 bags of small cukes and other stuff to make Bread and Butter pickles. I thought I might have blogged about this last year cause I make them every year, but I hadn't. There must have been something more interesting on pickling day last year. I got this simple and quick recipe from my sister a long time ago, I wouldn't even guess when. It's never failed me yet. If you want to make them yourself, here's the recipe. Combine chopped veg with 1/3 cup of course salt. Put half veg in a large bowl and put a try of ice cubes. Then put the rest of the veg on top and put another layer of ice cubes over that. Let stand for 3 hours. Then drain off the salt and water brine, rinse the veg, and remove any unmelted ice. Put remaining ingredients in a large large pot and high heat. When sugar is dissolved, add all the cold vegetables. Bring all this to a boil. There doesn't seem like much liquid, but when it all comes to a boil, you'll see that there is lots of juice now. When the boil happens (takes about 15 min), stir well and then remove from heat and bottle in mason style jars. First I have to say, this quilt is NOT for Aurora. I had this quilt started and well on its way last week when Mitchell visited me for the day. He said " That's for Aurora. You make EVERYTHING for Aurora!" Does that sound like a bit of jealousy or what? So, our conversation went in the direction of a bit of reminiscing. About some of the projects that I made for him in the past. As he was remembering these quilts and projects he said "Oh, Yeah". I then went on to tell him that this quilt is not for Aurora. This quilt was for Grammie (me) to have at my house for when visitors came. So this is my finished "Quilt as you go Poodle quilt". 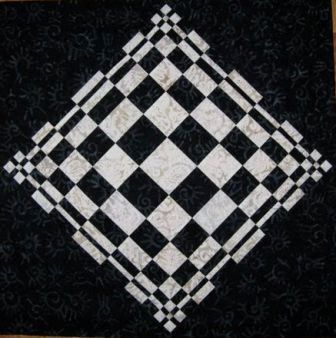 I used scrappy 7.5" blocks put together into 6 mock "Quilt as you go" sashed blocks. You can see the 6 parts from my post last week or click here for a picture. I machine stippled and quilted each of the 6 blocks. 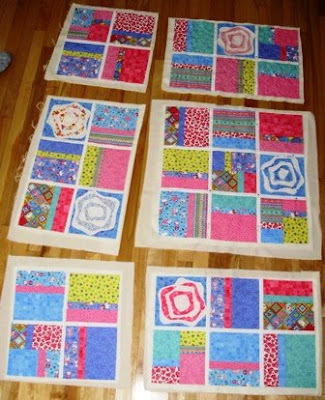 Then put the 6 large blocks together with the real "Quilt as you go" technique from this link. 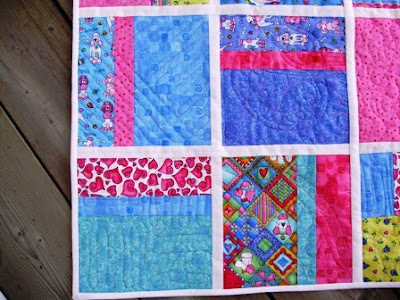 I never thought about putting a border on this quilt until I had the 6 large blocks sandwiched, and decided I would not put a border, but simply use a bias binding in white. The fabrics are really fun and colorful. They are leftovers from a bundle of Moda fat quarts called Oodles of Poodles. It will make a great quilt to put embroidery patches on. Notice the Rose blocks in the quilt. I've been saying it for a couple of weeks, but I really do I do plan to do a tutorial on how I made them. It's a really efficient way to make the blocks with very little waste. I'm pleased with this little quilt. What a nice surprise. Jess and Em who live in Moncton came to spend Friday and Saturday with us. We had fun with them by going on a mini-picnic on the Green. 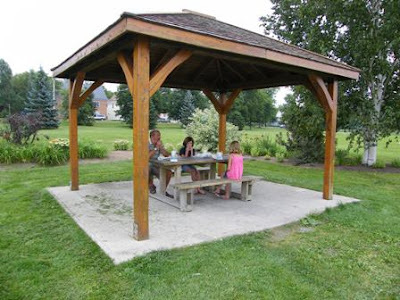 Normally when we go to the green at Carleton Park, this covered picnic table is always busy, but today, it was available. Lucky for us. We munched on a lunch from Subway. We then went to the store to buy a few groceries, then packed up and went to the cottage. Excitement is building as news of Hurricane Bill is announced. We'll need to secure the deck furniture, so why not enjoy the day at the lake. 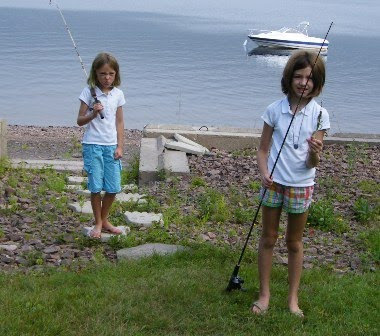 The kids went fishing with Grampie for a bit. A big fish was swimming around Emily's bait, but he was a smart fish and swam away without taking a bite. See their Mom and Dad's boat in the background. It's now safe and sound out of the water, just in case hurricane Bill makes the water more choppy than normal. Do you get the idea that Jessica is coming to the realization that her Grandmother is the Paparazzi. Ha ha. She's such a cutie. Emily is more than happy to pose for me still. She could be a model. We did a lot of painting this weekend. While I painted primer in our bathroom, the kids painted these little wooden boxes and then put their names on the box. They came out sweet. 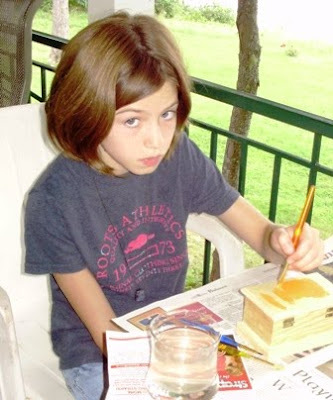 Then they painted rocks for my garden. Yipppeeee. 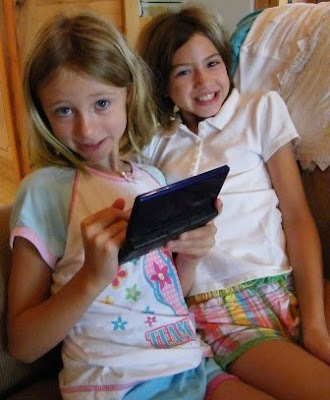 This is a great fun picture of the girls. Hurricane Bill came and went, and we hardly felt any effects at all. Oh, well, it's better to be safe than sorry. I expected that Grace would come on Friday, but I decided that today would be the day. Grace and I had a hard time to decide what special things to do, so we got Grampie to drive us to Michaels. We walked up and down the craft project aisles and looked at everything. Michaels is a great place to browse for projects. 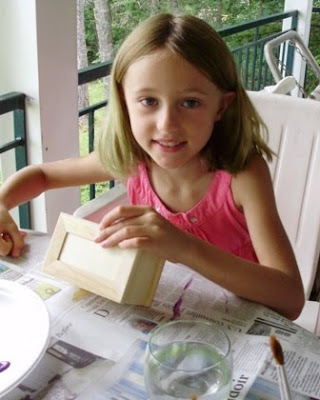 Grace picked out two really nice craft projects to work on. We also dropped into the Dollar store to get some craft paint and paint brushes. While there, Grace found the buy of a lifetime. A tamagachi like pet... for a dollar. 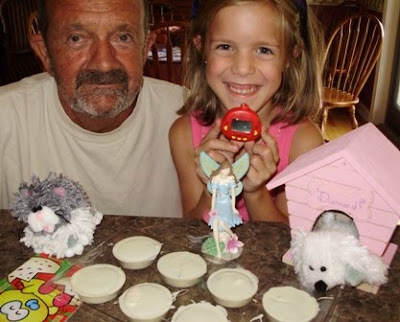 Grace was thrilled with it because she never had a tamagachi before. You can see it in the last picture below. After we got home from our crafts shopping trip, the first project Grace started is a really cute little dog house that came with a small white dog. Grace painted it pink and I printed the puppy's name over the door of the doghouse. "Diamond". 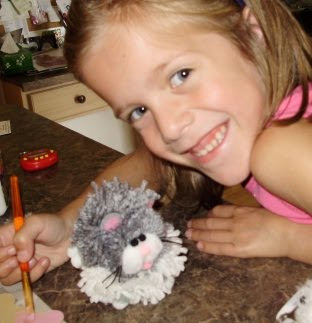 Next, we made a sweet pom pom cat project. The kit had everything in it to make a sweet cat. I think we forgot to name him... Grace was over the moon with this project, especially when we put the eyes, whiskers and toungue on the cat. We had to use a hot glue gun to stick them together, so I did that while Grace sorted out all 25 big and little pom poms. The next project was a Wilton project. First you carefully paint melted colored chocolate in the candy mold. 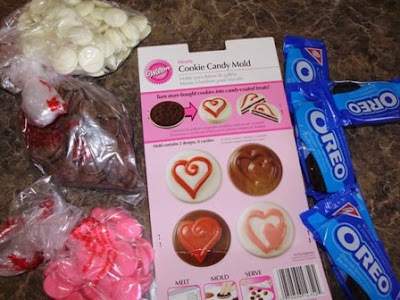 Then you put an Oreo cookie in the mold. After that, put melted white chocolate over it so it's all covered. You'll need to put it in the fridge until they firm up. 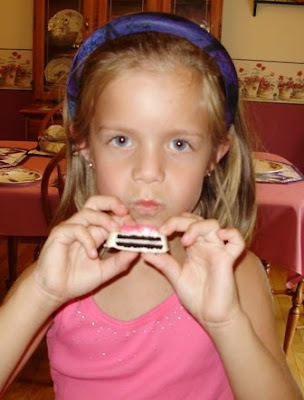 Grace did a taste test and they were really yummy. Do you see what they look like inside? You can see the chocolate Oreo stripe really well with the white chocolate. These were really fun to make and Grace took them home to share with her brother and sister. And maybe Daddy too. Because Grace drew the short straw, she came to visit third. It was predetermined that because the third kid had to wait so long, they would get a special gift. So the something extra for Grace, was a delicate little Enchanted Fairy figurine that is named Grace. 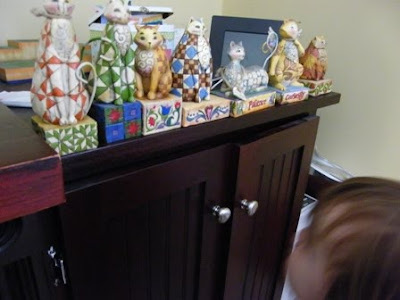 Grace is going to keep it on her special shelf where she keeps her nice things. And at the end of the day, guess what Grace had for supper. Yep, she wanted a Belgian waffle. Just like her sister the day before, and just like her brother the day before. 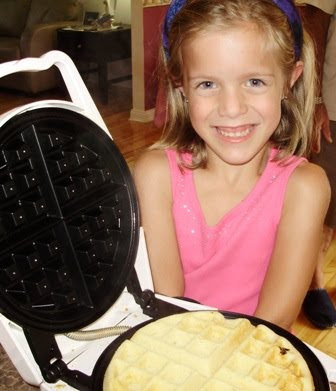 They all love waffles. Thanks for spending the day with us Grace. Grammie and Grampie loved having you over for a visit. Caitlin came for a visit today. We had so much fun. After we had lunch, we walked to the Devon outdoor pool and spent an hour in the pool. We didn't take a camera but you can just imagine how cool the water was. Before we went for our swim, Caitlin made 6 huge cupcakes all by herself. 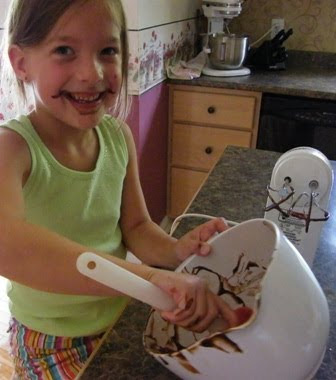 She added all the ingredients and mixed them with the mixer. 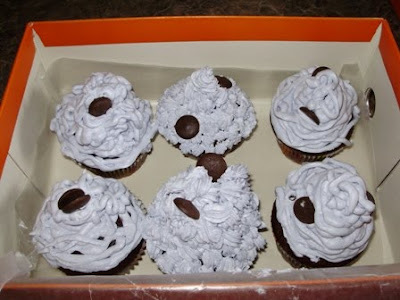 We baked them in the cupcake papers and when they were done, we took the out to cool while we went for our swim. 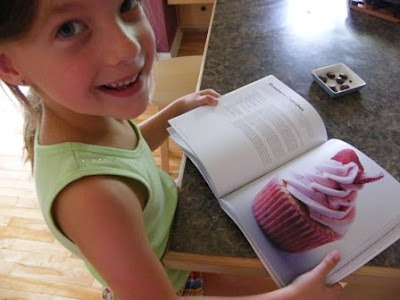 When we got back from our swim, Caitlin went through my cupcake book and picked out a fabulous design. She made it a different color and put some of her own design in it. See her video below to show how good she is at doing stars with the special Wilton star tip. See her finished 6 pack of cupcakes. 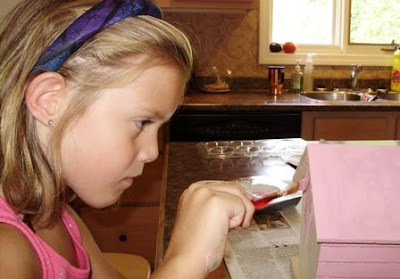 Then after all 6 of the cupcakes were decorated and safely in the fridge away from grampie, we went up in to the sewing room to work on a surprise gift for mom. It's a beautiful piece of jewelry that is made up of very special colors. Each of the three little tags is purple - amethyst - for February which is the triplets birth month. 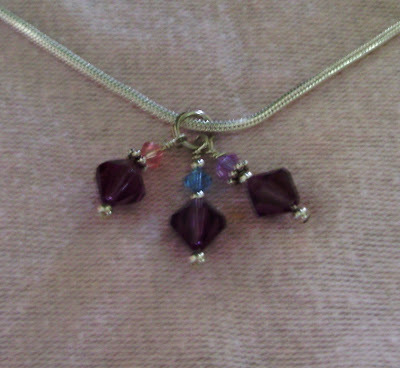 Then each amethyst is adorned with a smaller bead that is each of the kids favorite color. Isn't this nice! She is taking the cupcakes home to share with her brother and sister. Next, Grace will come for the day probably on Friday. I'm thinking up a list of things to do, and I have a special gift for Grace, cause she is the last one to come. The kids drew straws to decide who would come first, second and third. Before the draw, I promised that who ever came third, would get a special gift. So on Friday, I'll show you the special gift. 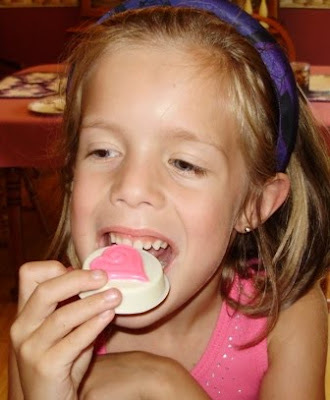 Hey Michelle Matheson, check out our little cupcake decorator below. Mitchell came for a visit today. It was the hottest day of the year, but that didn't stop Mitchell's will to get in as much as he could today. First he went to a golf lesson with Grampie. It was so hot, after the lesson, and his complimentary hot dog and drink, they headed home because of the heat. It was already at about 28 degrees by 10:30 in the morning. When they came home from their lesson, Mitchell and I launched into our game plan. We would cook something, we would sew something, and then we would make something else. 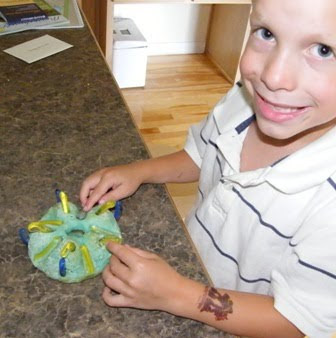 Mitchell and I decided we would do this paperweight collage for a craft project. So off we went to the Dollar store to buy some rocks or shells. We came home with a bag of funky glass. Grampie dug through the recycle to find a 2 litre bottle to use as a form. This is the link we used for this neat little craft is here. It turned out really nice and might be the perfect paperweight for mommy to use in her new job. 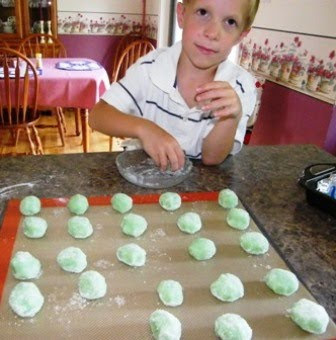 Next he wanted to make Memere's Raisin cookies, but I don't have her recipe, so he was pleased with these blue/green sugar cookies. I made up the dough, and he rolled them in sugar and placed them on the cookie sheet. 11 minutes later, they were done. He and grampie taste tested about 5 of them, and they passed the test with flying colors. 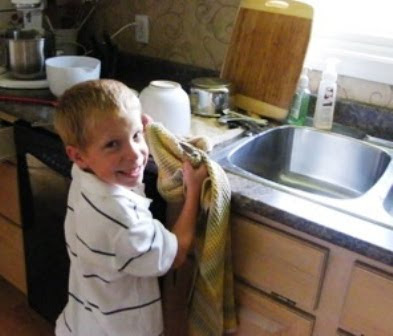 After all of that, we had to clean up lots of dishes, so he did them by himself while I started to make our supper. He never did dishes before, so he did a great job. He dried them too and put all the silverware in the drawer. Great Job Mitchell. For our special sewing project, Mitchell picked a puppy. He found a pattern in my box for a puppy. And I happen to have some black fun fur. Perfect. A 1 hour sewing job mostly done by me, but he helped me pick up black fake fur from all over the house after it was done. The puppy is so cute and he has floppy ears. All this, and it's still hot hot hot out. Caitlin is the next to come for a visit. That may be tomorrow... stay tuned for Part II. It's almost like our summer arrived big time, but it's a month late. We just got back from 4 beautiful days at the cottage. Late last week, I really enjoyed a visit from my sister. We talked about healthy eating, counted weight watcher meal points, did yoga, went for early power walks. Here's a picture of her and I at a local farmers market called the Big Potato. 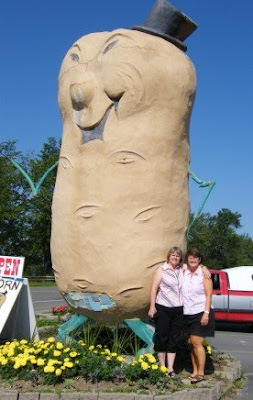 This giant potato is always interesting to visitors because we always see people lined up to take a picture in front of it. It's so cheezy, so when we stopped and the picture taking area was completely clear, we took our picture in front of the big potato. Isn't it fun? 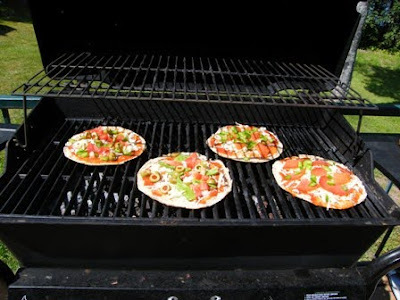 At the Big Potato veggie stand, we bought nice veggies to put on our bbq'd pita pizzas. They were a really nice light lunch and low in weight watcher points. This is definitely a nice change from my regular lunches and I'll probably have it every weekend. What a treat!! While here, my sister helped Stephanie, her oldest daughter, pack for her up coming move to Korea. Stephanie has a teaching contract for 1 year and she's very excited to do some traveling and to explore this very different culture. There's a lot to think about when moving to another country and I'm sure Stef really appreciated her mother's organizational talents. Early Saturday, my sister and her hubby picked up Stephanie, her cats, and her belongings and home they went to Greenwood. They'll be saying good-bye to family on Monday evening, and them Stef leaves from Halifax airport bright and early Tuesday morning. Good Luck Stephanie. What a great adventure. So we spent a quiet day at the lake on Saturday. Aurora and her mama came to the cottage on Sunday and stayed until after supper today. The baby loves all the different things at the cottage. 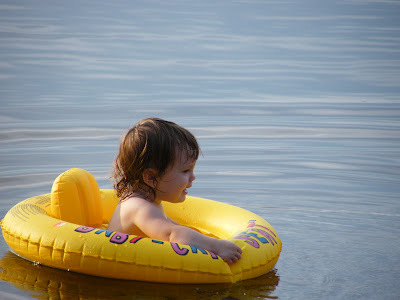 She's so comfortable in the water and enjoys many little trips across the short beach to the cooling water. 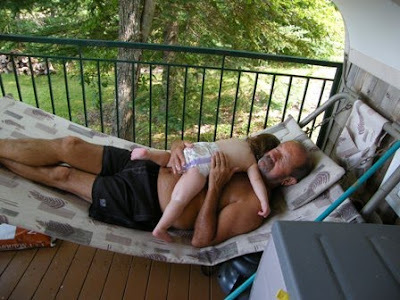 She's good to take her naps, but she plays a little game and will try to pretend she's sleeping on grampie to avoid the trip up to the playpen. Here she is pretending to sleep. Grampie is pretending too. We got way too much sun in the past 4 days and it's good to be home though. This week, I've got a bit of sewing lined up and some special grammie and grampie days with each of the triplets individually. 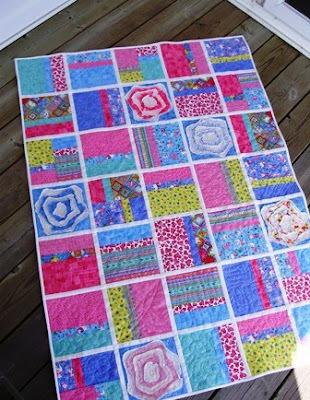 Quilt as you go - A childs quilt for my house! Last year, for when I have little visitors, I made myself a nice little quilt to have at my house. I bought a fun package of 18 fat quarters from Moda's "Oodles of poodles" line and I was inspired by the French Rose quilt that my friend Willa had made the year before and won a first place ribbon at our local quilt show. See the poodles, aren't they so cute? So now that Baby Aurora is out of a crib and into a little girl bed, my little rose quilt now is on her bed. I'm glad that I saved all the leftover pieces of fabric together, because last week, I cut strips and made blocks out of them. I had thirty 7.5 inch blocks and five rose blocks. I planned to quilt them individually and put these blocks together with a "Quilt as you go" technique. I awoke in the middle of the night thinking about the quilting as you go part of this project, and decided to do a mock quilt as you go to put some of the blocks together, then do a the quilt as you go technique on multi-block sections. Do you know what I mean? Now, I have 6 sections of my quilt sandwiched and ready to machine quilt on my Juki. Then putting the sections together with the quilt as you go technique. Click here for the technique that I use, but there are other methods out there on the Internet. I didn't think ahead enough for a border, so I may just bind it and call it done. 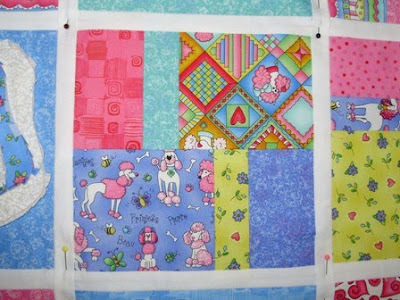 Watch for a picture of my completed Poodles quilt mid next week. Also, some people have asked how I do my rose blocks. I plan to do a tutorial on my method of making the rose block so there is minimal waste. So be on the watch for that as well next week. We had a nice day sewing the bump yesterday. I only got really confused once and had to rip out 3 full seams. :S But in the end, I'm pleased with my bump. I will finish this week with simple borders. 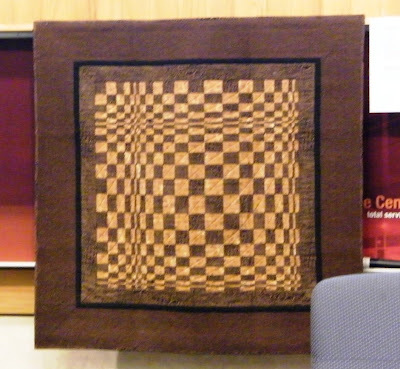 I am really quite taken with these type of optical illusion quilts that you can make with cutting simple strips. 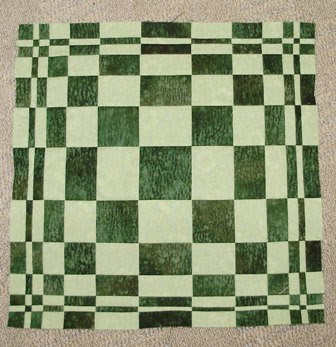 Mine is shown here in light and dark greens with the very center shown in the darker fabric. Here is my friend Kathy's bump. Her bump is made out of beautiful black and white batiks. Notice that the very center of her bump is made out of the light fabric. Do you think the light or dark center adds to the effect of the illusion? Squint your eyes a bit to get the better optical illusion effect. Kathy added side triangles so that her bump finishes on point for a very floaty effect. Wow, it's a beautiful piece, don't you think? This was a fun and quick project and many thanks to our other friend Linda G for figuring it out, doing a prototype, writing instructions for us and leading us in this little workshop. I can't believe it's been a week since I blogged. Now that the nice weather is here, we take advantage and head to the cottage and we've been there a couple of times in the past week. But alas, it's drizzly today, so I'm back at the computer. Later today is going to be a fun day. Some friends and I are going to sew the Bump, that you might have seen in an earlier post. By cutting strips of contrasting colors, you get the illusion of a stretched out bump in the center. Do you see it? We're just sewing a small version to get the hang of it. If we like doing it, then we can make a bigger one which I probably will. This is a picture of one by Gerta DeVries, who inspired us by giving a Math Lecture at UNB in June. I'll so you my mini sample tomorrow. I was reading my friend Linda's blog about her trip to Maine last week. Her remarks about her trip to L.L. Bean reminded me that I bought a pair of white jeans there last year. It was on a drive through Maine, we had stopped in just to browse around and have a break from driving. As I was browsing the discount rack and saw these white jeans were my size but they had a red price tag - $1.80. I snatched them up quickly so nobody else would get them. I tried them on... They fit!! I casually walked over to the cashier and said "I think these might be mispriced but can I have them for that price anyway?" The girl said "Oh, no" In that instant, my heart sank...and I thought to myself...So what is she going to charge me?. But her sentence continued. "Those are not mispriced, that's the right price. It's a super super discount price because they've been here for a long time". Yippee for me, so I bought them and I felt great that I had a pair of Bean Jeans for a buck eighty. That made my day. So, after our short visit at Beans, we continued on our way and when we got home, I had put them in a drawer and planned to hem them when the weather gets cooler. That was over a year ago. Linda's blog reminded me of them, so I got them out and hemmed them today, so I'm all ready to wear them on cool summer fall mornings. 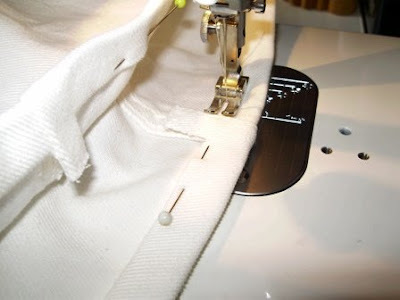 If you're wondering what those little tail things are in the hem of my jeans, look at my hemming jeans tutorial. Is there still a rule that says no white after Sept first?